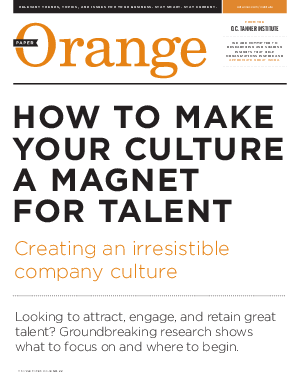 Looking to attract, engage, and retain great talent? Groundbreaking research shows what to focus on and where to begin. We call them talent magnets because they are the precise attributes that make your organization attractive to employees. They are: Purpose, Leadership, Opportunity, Success, Appreciation, and Wellbeing. If you improve your culture in all six areas, even marginally, you will see positive business results. The magnets are also interrelated. Improve just one, and you’ll get a boost in all the others. For more information download the O.C. Tanner Institute report.